Kirk Webb's gift of fly-fishing of given to him by his father at the age eight, when he then received a fly tying kit under the Christmas tree that winter. Moving from the shores of Lake Michigan to the Front Range of Colorado four years later, Kirk immersed himself into the world of fly-fishing where his life was forever changed. Kirk Webb has been a professional guide in the Aspen and Glenwood Springs area since 2002. 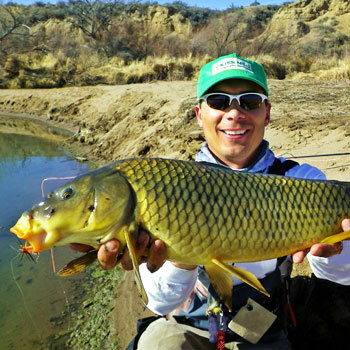 The lower Colorado River just below Glenwood Springs offers not only trout fishing but carp as well. Listen in an learn about this unique fishery and how to fish it. His first job was in a fly shop when he was sixteen years old, and Kirk has successfully stayed in the industry ever since, never working a “real” job, and has fished his life away happily ever since. Kirk credits his undying love of the sport by having many great mentors along the way, leading him in his path of love, family, life and fishing (in that order) including Tim Heng, Roy Palm and Frank Moore. Kirk has worked at Taylor Creek Fly Shop in Basalt since 2002, where he most enjoys fishing with his 11 year old daughter, Madison.